Interested in an inter-dimensional spaceship, paradoxes, and plot twists? Doctor Who just might be the show for you! Doctor Who is the longest-running science fiction show, and yet, fans never seem to tire of it. It’s hard to get bored of traveling through time and space and defeating aliens, is it not? The show centers around the Doctor, a time traveling alien who finds friends from across the universe (but mostly from London, England) and saves the world on a regular basis. Every few years, The Doctor regenerates, and after 36 seasons and over 50 years, the Thirteenth Doctor is female! The newest season brought exciting new changes: a new writer, a new TARDIS, a new, female doctor, and thankfully, finally, a more diverse cast. With that being said, it also brought mixed reviews. Rick Austin writes in the Fortress publication that, “It’s unclear what the point is in making the extraordinary seem so bland, but they’ve done it here and it simply doesn’t feel right for Doctor Who.” I have to agree with him when it comes to the writing. Chris Chibnall, the new writer for this season, wrote ten stand-alone episodes. Many of them had predictable endings, and if the endings weren’t predictable, they fell flat. He tried to make things that were not-so-extraordinary seem magical and vice versa. At one point, I was so excited to see an old character come back, but what did we get? A frog. A literal frog. At the same time, the acting this season was nothing short of fantastic. I could write a whole article on Jodie Whittaker’s spectacular acting. In fact, all of the actors really stepped up to the plate. Tosin Cole plays Ryan Sinclair, a 19 year old who runs a YouTube channel and is the first character I have seen on television who lives with dyspraxia. Mandip Gill plays Yasmin Khan, the smart and level-headed one who loves adventure. Bradley Walsh plays Graham O’Brien, who really just wants to eat. He’s there for the laughs. They developed the characters with little to no development in the script. That’s talent. There were definitely some amazing highlights to this season. The “Rosa Parks” episode, which was by far the strongest, was extremely emotional while still somehow being funny. It simultaneously tackled the issue of racism in 1950s America, acknowledged that the fight for equal rights isn’t over, and didn’t sugarcoat anything. I also liked the Kerblam! Episode, which portrayed a company like Amazon Delivery Services but with aliens, conspiracies, and bombs. Another favorite was the Demons of the Punjab, which took place during the India-Pakistan partition. Did I watch the New Year’s Special twice? Maybe. The cinematography throughout the entire season was absolutely fantastic. I mean, what other series can effortlessly film space fireworks, car chases, alien parasites, and an exploding sun in one episode? I was impressed. Season Eleven broke a lot of glass ceilings. The first female doctor really made a great impression. The diverse supporting characters were funny and relatable in their own ways. All of the acting was spectacular, and so was the costume department, the special effects, and the general plot. Was it better than Season Seven? No. But nothing can really beat Season Seven. 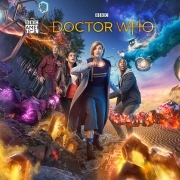 I think we can ignore Chris Chibnall’s writing, excluding the frog, and simply enjoy the show for what it is: a funny, heartwarming show with a sci-fi twist.